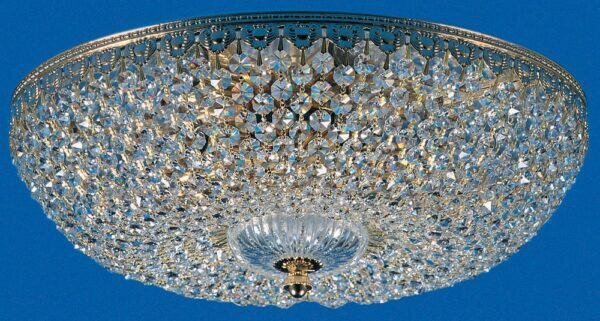 The Impex Hanover gold plated flush 5 lamp Strass crystal ceiling light is traditional and features a flush mount and circular detailed frame adorned with Strass crystal. Draped crystal strings hang down from the top to the lower finial creating a sparkling domed curtain that covers the fitting completely. The 5 lamps are housed within the crystals creating a beautiful, glittering effect. From the prestige lighting collection, a spectacular feature Strass crystal flush light, with style, quality and impeccable detail. Capture the glittering ambience of the Prestige lighting collection in any space whilst adding a focal point to any room with a low ceiling. Ideal for use in a dining room, living room, bedroom, hallway or landing. Shown here finished in gold plate but also available in polished nickel (ST00210/40/05/G) and antique brass (ST00210/40/05/AB) but there are no images available at this time. Please contact us if you wish to enquire about these options. Impex Lighting are one of Europe’s leading manufacturers who supply a comprehensive ranges of fittings in traditional, contemporary and classic styles like the Hanover gold plated flush 5 lamp Strass crystal ceiling light featured here.